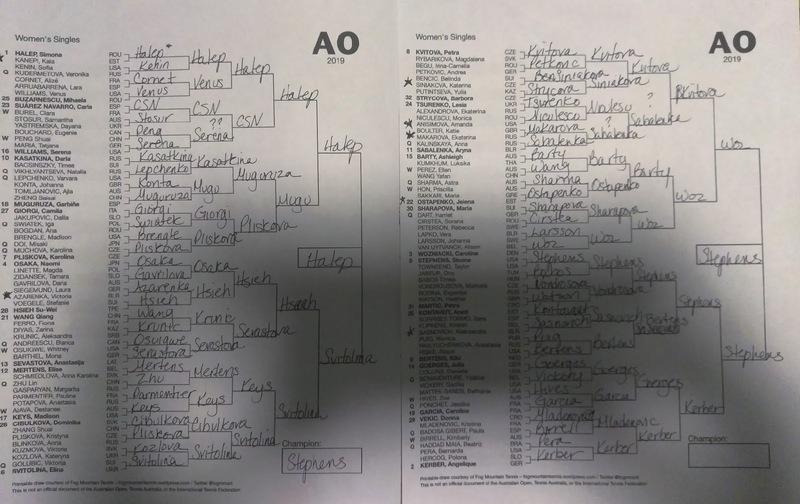 My biggest takeaway is that the Serena/Halep quarter is loaded. But at least Serena can be grateful for the fact that Ekaterina Makarova isn't in her half. Yeah, so I blindly chose Kiki Bertens to win the Australian before the draws came out. Then I filled out the draw and ... I can't see her getting through her half? Sloane Stephens is there. Aliaksandra Sasnovich is there. Angelique Kerber. So we'll see. But clearly I went with Sloane Stephens. Simona Halep v. Kaia Kanepi: This seems unfair. What's the point of being the top seed when Kaia "Walking Dead-bandages" Kanepi is the first face you see when you get on court? Laura Siegemund v. Victoria Azarenka: This should be a good one. I think Azarenka will win, but I wonder if even she believes she's Slam-run ready. Belinda Bencic v. Denise Siniakova: Ah, Belinda. I'm concerned. Monica Niculescu v. Amanda Anisimova: Just mentioning because I think this will be fun to watch. Niculescu is fun to watch, but if you played anyone with that skill set in your league, you'd basically accuse her of cheating. Maria Sakkari v. Jelena Ostapenko: Man. Who knows. Kirsten Flipkens v. Sasnovitch: Good test for Sasnovich, because Flipkens also has an annoying game.